People often say that restaurant salads taste better than what they make at home. This recipe will change their minds! The beauty of this salad is that it can be made a thousand different ways based on what you are in the mood for and what you have on hand. Typically, I make a similar salad with savoy or napa cabbage (for a really quick meal, a bag of pre-cut cabbage will do! ), but some beautiful bok choy inspired me this time around. Baby bok choy is crisp and mild tasting, perfect for eating raw. I sliced it thinly, then added vegetables I had on hand. The dressing — a peanut-curry sauce enhanced by ginger and soy sauce — really knocks this recipe out of the ballpark. The first time I made it, my kids raved. There was a small amount leftover, to which everyone laid claim. To stretch it into a second meal, I added chopped spinach and a handful of peanuts…and more sauce, of course! This can definitely be a meatless meal. I had two leftover, grilled chicken breasts which had been marinated in a sauce I had recently used for stir fry. I haven’t posted that recipe separately, but you can find it at the bottom of this post. It is truly a wonderful marinade, especially if you have time to let the meat soak all day, or even overnight. Shred or chop the chicken; add shrimp if you like. Toss in extra nuts, cucumbers or jicama. This is truly one of those recipes that you can make a little differently each time, to repeated rave reviews. The key really is a phenomenal sauce. 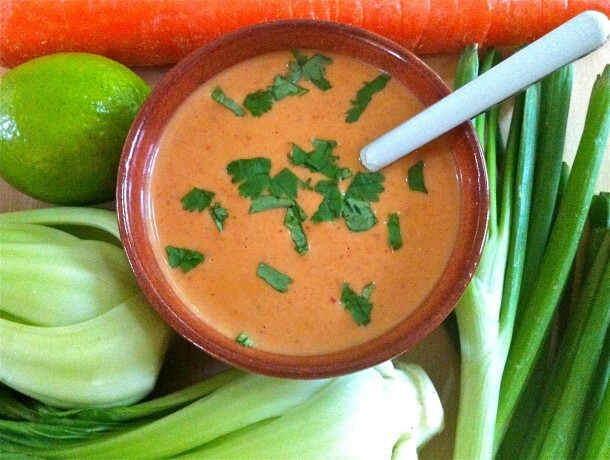 Speaking of the sauce, let your imagination guide you and use it as a dipping sauce for raw veggies or chicken satay, a Thai-inspired pita sandwich or wrap, even a sauce for pizza or pasta. The possibilities are endless…and all delicious! 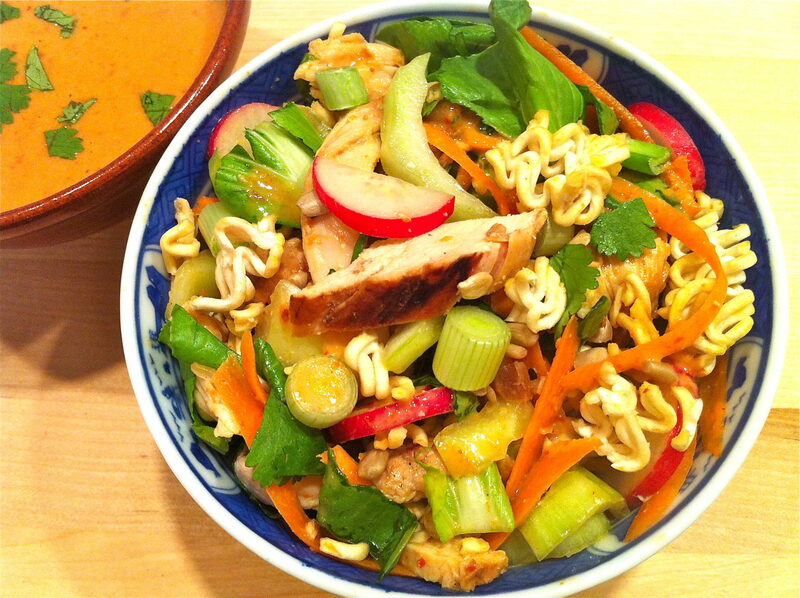 Mix all ingredients in a large salad bowl and toss with Thai Ginger Peanut Sauce. If desired, serve with a bowl of sauce for extra drizzling. Whisk all ingredients together and store, covered, in the refrigerator until ready to use. Perfect as a sauce for pasta, chicken, shrimp, veggies, salads, sandwiches, etc. The dressing was inspired by my friend–and talented cook–Ann at Sumptuous Spoonfuls. This sounds delicious! I especially love the sound of that sauce. Pinned! I made this salad last night and really enjoyed it–even though I used too much dressing. I find that I get all my new recipes from your welcoming site. Your recipes are not intimidating; they are healthy and family-friendly. I’ll keep returning to the Fountain Avenue Kitchen. Thanks! I don;t see your marinate??? ?